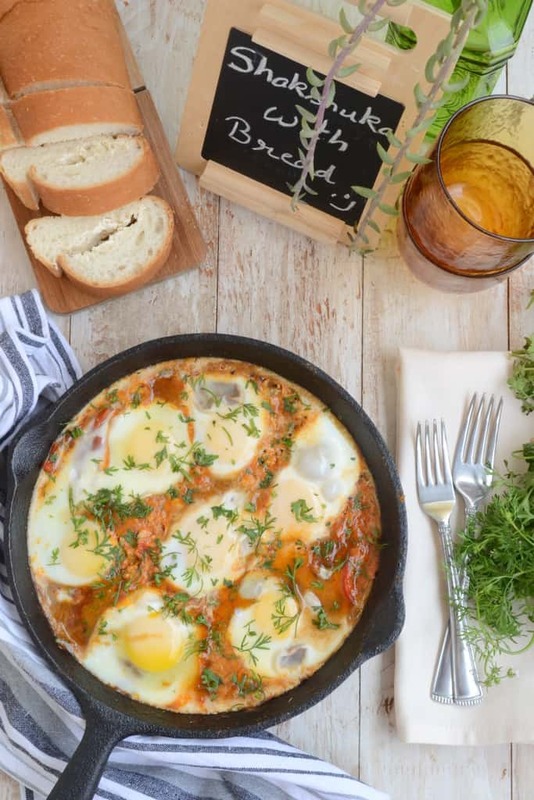 Shakshuka is a North African dish in which eggs are poached in tomato and bell pepper based spicy sauce. Moreover, it is traditionally served up in a cast iron pan for breakfast with some bread to mop up the sauce. 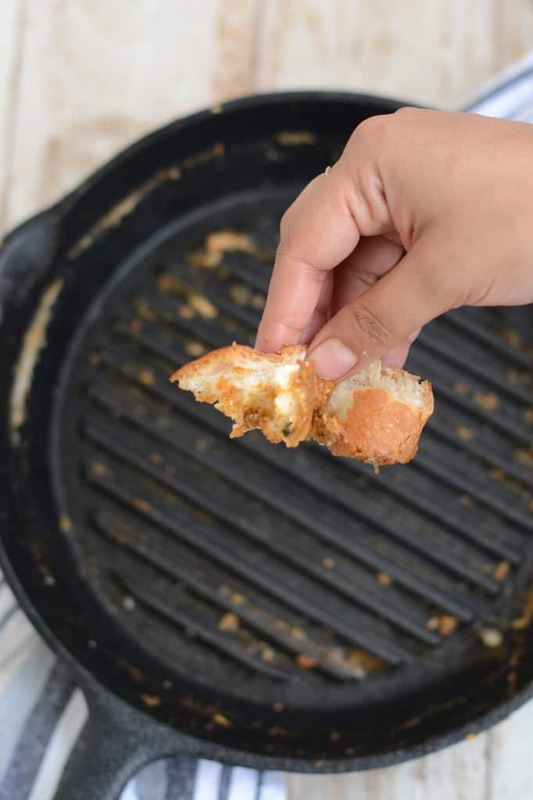 So, here’s how to make this simple, easy egg dish at home! I cook the egg for breakfast many a times. 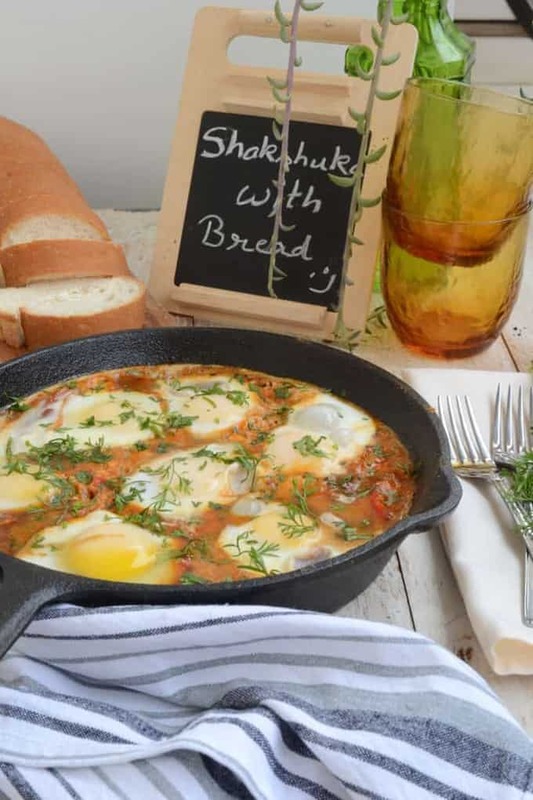 However, sometimes when you yearn for a change I count on Shakshuka. 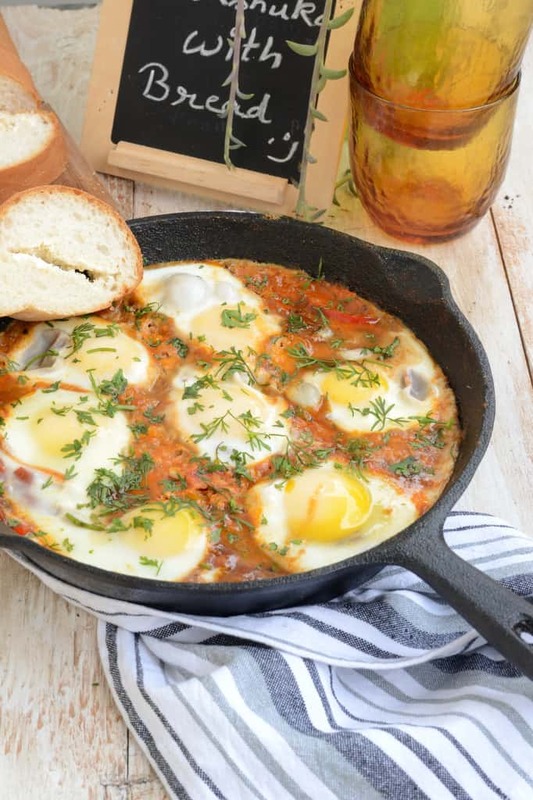 Made by poaching eggs in a saucy red pepper, tomato mixture/tomato sauce, Shakshuka is a pleasing North Africa style breakfast/brunch dish. Furthermore, this dish is liked in many middle eastern countries as well. 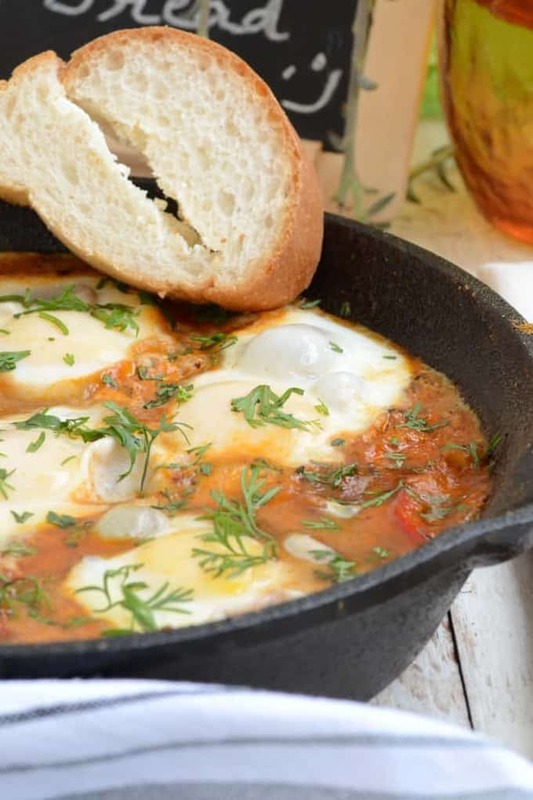 Although, the ingredients for Shakshuka are pretty much basic. yet this dish tastes exceptional. Because you just need eggs, handy veggies, olive oil, salt and pepper et al to make it on the go and still eat the best meal of the day. I make an Indian version of this dish which I learned from Mohit’s aunt. We call it broken egg’s curry. Instead of boiling the eggs and putting them in the masala, I break the eggs on top of the masala and cook them which is just loved by everyone. 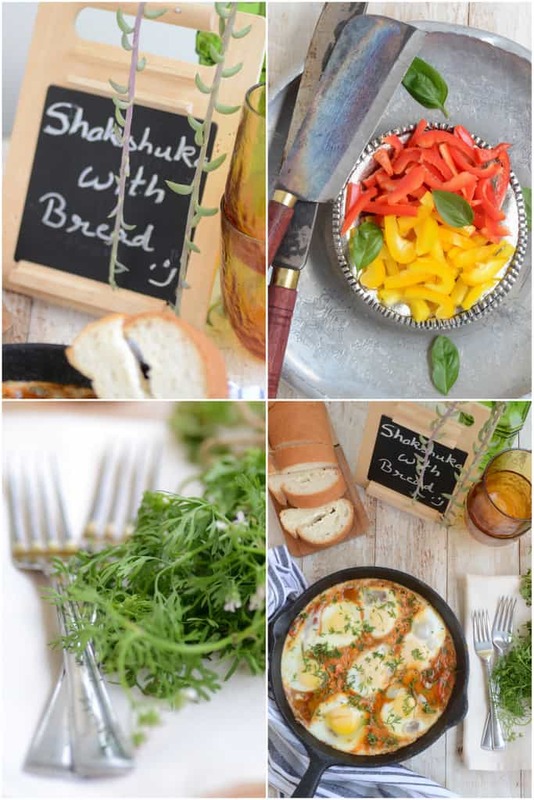 So it was no surprise that everyone loved Shakshuka as well and helped themselves twice and the pan was slick clean when I kept it for wash. We ate it with a loaf of garlic bread and it was the perfect side to mop up the sauce. You can also eat it with pita bread or any other bread of your choice. 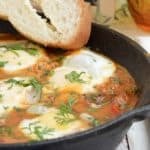 Shakshuka - Eggs poached in spicy tomato sauce. Firstly, add garlic and cook till slightly browned. Now, add onions and fry for a minute. Next, add tomatoes and bell peppers. Then, add a cup of water and cook till bell peppers and tomatoes are cooked. Lastly, add salt, red chili powder, cumin powder, honey and coriander powder. Cook for 3-4 minutes on high heat. Add half cup water and cook for a minute. Simmer the heat and let the eggs cook. You can cover the pan at this stage. 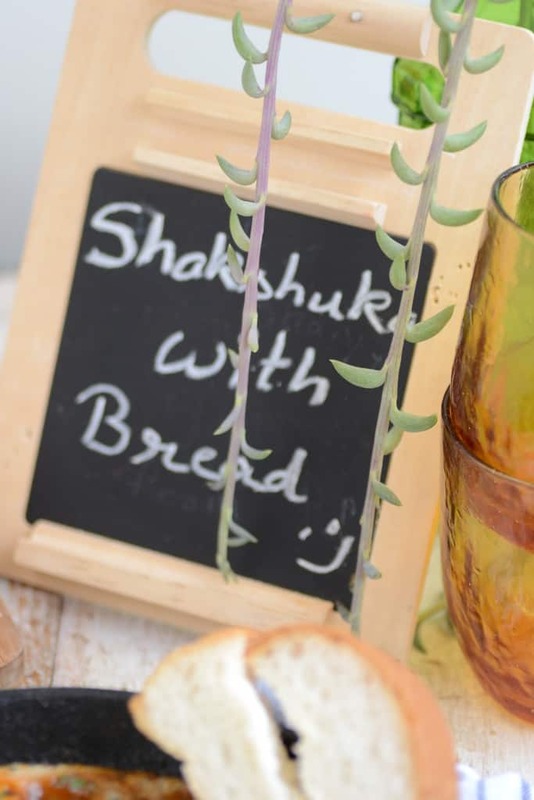 Serve with a loaf of bread on the side. Looks such a quick and comforting kind of meal. Lovely pics. My kind of meal, loving it.Prefect brunch on sundays. Hi, I tried this recipe when was in no mood to cook elaborate and it came out so well.. we really cleaned the pan in which we cooked this dish. Just tried it this morning w half an onion instead of the pepper, on account of being out, and found this remarkably easy and scrumptious, to boot. Definitely will remake in the future. Thanks.